I'm an all round general handyman of 10 years experience in all maintenance aspects from and audio-visual installations and office fit-outs to plumbing, electrical, painting, plastering, carpentry, flooring, roofing, fitting doors, locks and all common fixtures. I also build sheds, decks and pergolas.We offer mowing, tree lopping and light rubbish removals too. I am one of the most versatile airtaskers on here. I usually keep busy with my own work and customer base, but am always happy to do a small job on the way home. Based at Parramatta, I have a small team of casual employees, and my rates begin at $40/hr. 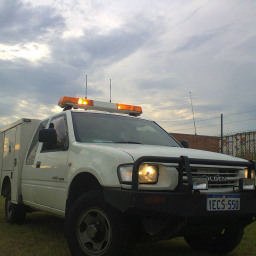 Well equipped with a wide array of tools we have a 1 tonne ute and trailer for delivering and removing items. "You break it - I'll fix it!" Stephen A. said “Unfortunately he was late, but his workmanship and personality were top level. Change 5 halogen light bulbs. Small front yard and nature strip mowed. Tim K. said “Greg is skilled, efficient, and reliable. I will definitely be requesting his services again. Felicity C. said “Greg was fantastic he was running late and let me know. The job he did on the fixing of the clothesline was professional, and now I can hang out as much washing as I have all the time. Next time I need a handy man he's the one. Pick up my brother/Pick up boxes/drop off home.